Summary of today’s show: Father Joseph Mazzone became pastor of St. Mary Parish in Hull just four years out of the seminary. Scot Landry and Fr. Mark O’Connell sit down with Fr. Joe to talk about life as a parish priest on “the peninsula”, Hull, a close-knit seaside community, as well as his path to the priesthood from Providence to Notre Dame to Prague and then to Boston, where he entered Blessed John XXIII Seminary, which forms men who have “late” vocations. 1st segment: Scot Landry welcomed Fr. Mark O’Connell back to the show and they discussed a news story this week about an article in the Economist magazine about church finances in the US. Fr. Mark said in his previous work, he was in charge of the Clergy Fund. During that time, they found out through audits that there was trouble in the clergy fund. He had to go to the priests of the Archdiocese to tell them that there was trouble and one of the slides in his presentation was misinterpreted that seemed to show that contributions from the mid-80s to the mid-90s were not given to the Clergy Funds. Scot said the information was misinterpreted and that money was used for the medical care of the retired and active clergy. So the money was going to a different fund within the Clergy Funds, but the all the money was spent on the purposes for which it was intended, the care of the priests. Fr. Mark said that particular slide was written so poorly that the priests became angry and demanded an outside audit to determine if money was stolen from the Clergy Funds. The outside audit explained that this was a legitimate use of the money and recommended some changes. Today, the Clergy Funds is almost in the black, if not already in the black today. The Economist article’s author simply lifted the previous erroneous information and repeated it. The misleading information is repeated over and over. 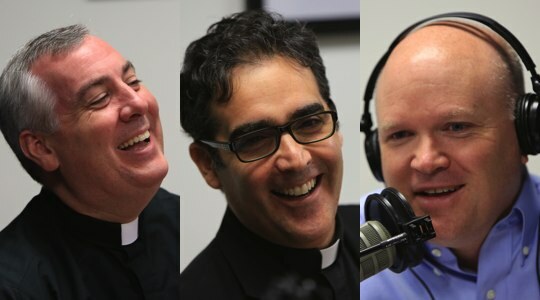 Today’s guest is Father Joseph Mazzone, pastor of St. Mary of Assumption Parish in Hull. Fr. Joe was ordained in 2008 after attending Blessed John XXIII Seminary. Before seminary, he worked in human services mostly in Boston. He’s not from Boston, but from Providence. He said both Sacred Heart, Weymouth, his first parish, and St. Mary’s have had patient and kind people who pray for him. He was named a pastor on February 1, 2011. He hadn’t even been a priest for three years. Scot noted back in the day, it would take 25 or 30 years before a priest would become pastor. Fr. Mark said when he was ordained he was told it would be 12 years before he became a pastor, although Fr. Mark has never been. Fr. Mark said he was ordained at 25 years old, but Fr. Joe comes with a lot more experience. Fr. Joe said he was surprised at being asked to become pastor already. The people at St. Mary’s were warm and inviting and it made the transition easier. The people had been praying for whomever their new pastor would be and it made a huge difference. Scot said Hull is off the beaten path as a peninsula and people have to intentionally go there. Fr. Joe said Hull is tight-knit with 11,000 people and has a strong sense of identity. It’s physically beautiful and you’re never more than 3 blocks from the water. Sunrise in the morning is a beautiful opportunity to pray. Within pastoral planning, they are connected with St. Anthony in Cohasset which is a little over seven miles. Fr. Joe said three of his four grandparents grew up on islands, Sicily and Madeira. He grew up on and around the water. In the summer, there are a lot of visitors. Fr. Joe said the Mass attendance goes up 15 to 20%. Scot said Sacred Heart in Weymouth stands out to him in his experience as warm and welcoming. He asked what makes St. Mary in Hull stand out. Fr. Joe said they have a great commitment to the poor and social justice, including through St. Vincent de Paul. It’s not a wealthy community, but is fairly middle class and extremely generous proportionally. He recalled that when Sacred Heart’s church burned down a few years ago, people attended Mass in the school hall and the Mass attendance drop at all. In the same way, the Church in Hull has had its challenges too. Hull used to have three parishes plus a chapel on Peddock’s Island. Two of the parishes merged into the third at St. Ann’s Church. Nevertheless, the community remained tight and committed to their faith. 2nd segment: Scot asked Fr. Joe what age he first started to think about the priesthood. He said he was very young. His parents were great models of faith and he loved going to church. He remembers one Mass with his father very early on a Sunday. He remembers looking into the sanctuary at the priest celebrating Mass and knew that something different and beautiful and holy was happening and that never left him. His mom had saved a picture he drew as a kid of what he wanted to be when he grew up and it was a priest. Fr. Mark said Fr. Joe took a long route to the priesthood. Fr. Joe said he graduated the University of Notre Dame in 1987. He had been thinking during his time there whether to become a diocesan priest or a member of the Congregation of the Holy Cross. He said it was a very Catholic experience. Each dorm had a daily Mass and spirituality is woven into the life of every student. There’s a high rate of Mass attendance among students. Scot, Fr. Mark, and Fr. Joe discussed their experiences of being at or visiting Notre Dame and seeing the faith lived out by the students. After college, Fr. Joe went to New Orleans for a two-year service project and then came back to the Northeast. Then he got an opportunity to work in Prague in the Czech Republic to write for the English-language newspaper there. He said responding to the call to the priesthood is different for each man. Every time he wanted to apply the seminary, he kept getting the sense that it wasn’t the right time. It eventually happened one year to the day after his father died. He said the three biggest influences on his priesthood were his parents, his parish priests, and Karl Malden. He played a priest in the movie On the Waterfront and Fr. Joe remembers seeing Malden as a great model of the priest, brave and courageous. Growing up as Sicilian and Portuguese, everything in their family lives revolved around the parish. They were at the church during the week all the time. He saw his parents live out their faith, not just in all they volunteered to do, but that their motivation for being kind and non-judgmental was their faith in JEsus Christ. They prayed the rosary every day, but they also prayed in little ways in everything they did. When he applied to the seminary, he was at work at the time. He was going back and forth whether to apply. He reached into a pile of articles on his desk and pulled out a magazine article with a prominent quote on it in which a nun said, “My father said, go into the convent and if you change your mind come home. That was 58 years ago.” And he took that as inspiration to apply. Fr. Mark asked why Fr. Joe chose Boston instead of Providence. Fr. joe said he’d lived and worked in Boston for a decade before applying and he’d made friends with a lot of Boston priests. Scot asked Fr. Joe about formation at Blessed John XXIII Seminary in Weston. Fr. Joe said it’s a national seminary. There were 17 men in his class, only 4 of whom were from Boston. Many of the men had also had careers before seminary and they brought all kinds of life experiences, like being a physician or carpet-layer or video store owner. He said they had great models of priesthood in the faculty who were very patient with all these middle-aged men who had been set in their ways. They went from being in charge of their own lives and then had to give it over to the seminary and give up so much autonomy. In addition, most of them hadn’t been involved in a college setting for decades in some cases. Fr. Joe said what he loves most as a priest is celebrating Mass. He celebrates Mass quite a lot in his parish and he loves it so much he never feels like it’s too much. Scot asked how much Fr. Joe prepares for Mass. He said he tries to pray over the Scriptures early in the week. He tries to stay current on events in the world. He doesn’t want his homilies to be political, but they should be topical. He loves to weave historical events into his homilies when they’re relevant. A wise priest once told him that if he hasn’t hit oil in seven minutes stop drilling and he tries to keep his homilies that length. Scot asked him about the challenge of preparing a homily to address all the different kinds of people who will hear it. Fr. Joe said some people want more catechesis, others want life experiences, others want a story they can tell, and others just want the Scriptures explained more. He tries to balance as much as he can, but you have to be yourself and you have to respond to how Christ is calling you to preach today. On the Feast of the Assumption, he talked about the encyclical of Pope Pius XII in 1950 on the doctrine of the Assumption and the people seemed moved by the Pope’s words. Scot said Fr. Joe serves on the committee that helps implement the Light Is On For You confession initiative in Advent and Lent. Fr. Joe said being a confessor is great because he knows what it’s like to be a penitent on the other side. He sees people who are transformed by confession. When he talks to people who have fallen away from the faith, when penance comes up that’s when the person gets very interested and it piques their interest on even an emotional level. Even when he talks to people at social events, they approach him in a very confessional way. One thing Fr. Joe has brought to Hull is the tradition of processions. The first year they did they had a statue of the Blessed Mother that they brought on board a boat, and then to a dock and then down streets with 350 people. He said people really turn out for the processions. Fr. Joe said people want to be public and and are proud of their Catholic faith. With very little publicity, hundreds of people turned out and the numbers keep going up each year. Fr. Joe talked about how often people have trouble wrapping their heads around the mysteries of our faith. We live in a culture that is not comfortable with the idea of mystery and not knowing something completely. Scot said when he hears a message that is hard to receive, he looks to the messenger and if he is trustworthy then to trust his message. Fr. Mark said when he looks at his previous homilies on these readings during the difficult years nine years and six years ago, these powerful lines stand out, especially Joshua saying he and his house will serve the Lord and Jesus knowing people will leave despite what he says. We have to make s stand and choose faith for ourselves. Scot said St. Peter’s response of faith is simple. Who else can we go to? Fr. Joe said when he talks with people who have drifted from the faith or those who haven’t but have great doubt and struggle, he tells them that even in our doubt we can never be disconnected from God, we always remain connected to him.